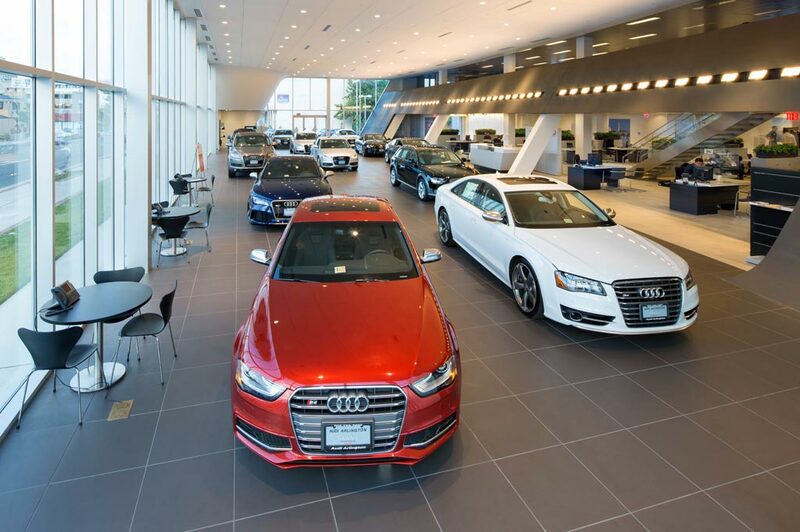 Carousel Audi Iowa City in Iowa City, IA treats the needs of each individual customer with paramount concern. We know that you have high expectations, and as a car dealer we enjoy the challenge of meeting and exceeding those standards each and every time. Allow us to demonstrate our commitment to excellence! Our experienced sales staff is eager to share its knowledge and enthusiasm with you. We encourage you to browse our online inventory, schedule a test drive and investigate financing options. You can also request more information about a vehicle using our online form or by calling (319)354-2550. Carousel Audi is Iowa's #1 volume New Audi and Pre-owned Audi retailer. We are also Iowa's only Audi dealership to receive multiple Magna Society awards (10 of them to date) and to be awarded to the Top 30 Audi retailers in North America. As Iowa's only locally owned and operated Audi retailer, we are committed to exceeding your expectations. Whether it's a new 2018-2019 or used Audi car, our skilled auto enthusiasts will help you find exactly what you're looking for. Looking for a reliable service or parts center serving the Iowa City, Marion, IA, North Liberty, IA, Cedar Rapids, IA or Coralville, IA areas? Come on down and get your fix at Carousel Audi Iowa City today! No matter your preference, Carousel Audi Iowa City has plenty of Audi options to choose from. Our online inventory is constantly being updated with listings of vehicles available in our showroom, including the all-new 2017-2018 Audi Q5, A4, Q7, A6 and A8. What matters most though, is your opinion, and which model grabs your attention. We believe the process should be as stress-free as possible, so relax, keep an open mind and try to picture yourself behind the wheel. Interested in the time-tested value of a pre-owned vehicle? Carousel Audi Iowa City has an incredible selection of used cars available here in Iowa City, IA. Our reliable array of vehicles spans across several auto brands, so you're sure to find a pre-owned vehicle that perfectly suits your needs. You don't have to worry about auto financing in Iowa City, IA. That's because our car loan and Audi specialists want to help you reach your goal: to drive home in the vehicle you desire. Carousel Audi Iowa City takes the time to explain all the details, making sure you understand every comfort, safety and entertainment feature there is. It's part of our job; but also, we enjoy helping turn dreams into reality. Carousel Audi Iowa City is also by your side whenever you need any car service and repair work done in Iowa City. Even if you haven't seen us before, we're proudly serving drivers in the North Liberty, Cedar Rapids and Coralville, IA areas. What's more, our auto parts team would be happy to get you whatever you need to keep your Audi vehicle on the road for many miles to come. Looking to find out more? We invite you to stop in and see us at Carousel Audi Iowa City of Iowa City, where we can keep the conversation going. We can be reached in a variety of ways; either over the phone at (888) 905-9262, through our website, or of course, in person at 809 Highway 1 West in Iowa City. Our team loves getting to know drivers in greater North Liberty, Cedar Rapids and Coralville, IA, and we strive to give you the most enjoyable experience possible. Feel free to swing by during regular business hours, and we can get the ball rolling and discuss all your car options.